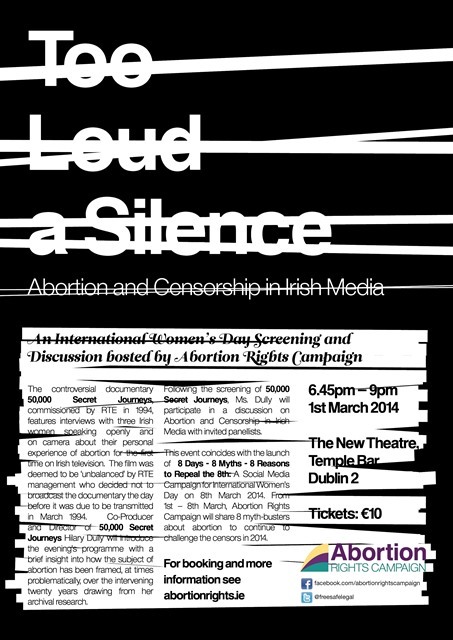 An International Women’s Day Screening and Discussion hosted by Abortion Rights Campaign. The controversial documentary 50,000 Secret Journeys, commissioned by RTE in 1994, features interviews with three Irish women speaking openly and on camera about their personal experience of abortion for the first time on Irish television. The film was deemed to be ‘unbalanced’ by RTE management who decided not to broadcast the documentary the day before it was due to be transmitted in March 1994. Co-Producer and Director of 50,000 Secret Journeys Hilary Dully will introduce the evening’s programme with a brief insight into how the subject of abortion has been framed, at times problematically, over the intervening twenty years drawing from her archival research. Watch a (trailer) for the film. Following the screening of 50,000 Secret Journeys , Ms. Dully will participate in a discussion on Abortion and Censorship in Irish Media with invited panelists. This event coincides with the launch of ‘8 Days – 8 Myths – 8 Reasons to Repeal the 8th: A Social Media Campaign for International Women’s Day on 8th March 2014′. 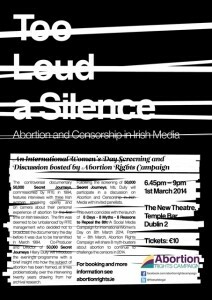 From 1st-8th March, Abortion Rights Campaign will share 8 mythbusters about abortion to continue to challenge the censors in 2014. Please note that the doors close at 7:00 pm and there will be no late admissions.